From the Michael Davitt bridge at Achill Sound - the bridge that connects Achill Island to the County Mayo mainland - proceed through the village of Achill Sound. About one mile from the bridge you will approach a wooded area. Take a left turn here, signposted the 'Atlantic Drive' (along with several more signs for local accommodation). The roadside at the beginning of this stretch has spectacular rhododendron plants from mid-May to June. Follow this road for about 5km, through the villages of Shraheens and Derreens to Cloughmore. You will pass directly by the historic church and graveyard at Kildavnet, and then the remains of the 16th Century tower house. The waters of Achill Sound will be to your left and on the opposite side of this channel is the Currane Peninsula, with the 524m peak of Curraune Hill dominating the skyline. At Cloughmore the road turns sharply right and suddenly the roadside cottages disappear as the calm waters of Achill Sound give way to the Atlantic breakers that crash against the southern shoreline of Achill Island. This stretch of road, from Cloughmore to Dooega, offers some of the most spectacular coastal scenery in Ireland. Directly opposite Cloughmore, separated by a narrow channel of water (the 'Blind Sound'), is the island of Achillbeg. This small island was probably once connected to Achill and has been uninhabited since the 1960s. Just to the west of Achillbeg is another much smaller piece of land, cut off from Achill Island at high tide, which houses Dúnnaglas promontory fort (Dún na Glaise, meaning 'fort of the moving water'). Achillbeg itself has the remains of three promontory forts. These forts consist of a projecting headland which is protected on the landward side by fortifications. They are thought to date from the Iron Age but may have been re-used during the Late Medieval period. The Atlantic Drive includes at least one further significant promontory fort - Dún Bunafahy - and the location of these forts demonstrates the strategic importance of Achill to sea traffic in former times. As you proceed along the Atlantic Drive, with Clare Island clearly visible to the south, there are also items of interest inland to your right. The ridges and furrows of old 'lazybed' crop cultivation can be seen, though these are now covered with grass and heather. These fields once provided potatoes and other cereal crops for families in a now deserted village. About four miles along the Atlantic Drive from Cloughmore the road rises steeply (cyclists may need to dismount and walk here) to a vantage point that overlooks the spectacular rocky cove of Ashleam Bay. 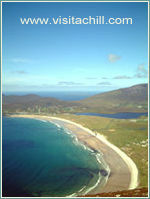 This bay consists of a pebbly beach enclosed by steep rocky cliffs - it is a well-know Achill landmark and features in the image at the top of this page. From the vantage point above Ashleam Bay, take the steep, winding road down towards the beach and up again to Ashleam village. From here you can either turn right and return towards Shraheens and then Achill Sound, or you can turn left and continue to follow the Atlantic Drive towards Dooega. 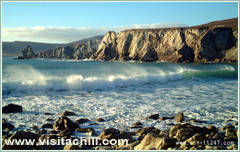 The old fishing village of Dooega contains one of Achill's five Blue Flag beaches. 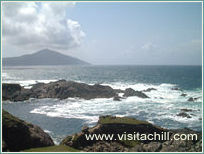 This part of Achill is part of the Gaeltacht - which means it is an Irish-speaking area. Until recently Gaelic was the primary language in this area. As you proceed through the village of Dooega, take a left turn signposted 'Minaun Heights'. This road will take you through the former Mission settlement of Mweelin, a scattering of cottages that shelters on the south-east slopes of Mweelin hill. This hill rises to accommodate Achill's third highest peak (466m) at Minaun Heights. The road you are taking will offer a left-hand turn to take you on a steep mountain road towards the top of Minaun. If your nerves - and brakes - permit, take this road to see one of the most dramatic views of Achill Island (see image, right). At the top of this road is the transmitter mast close to the top of Minaun Cliffs. From here you can see the magnificent 3km Trawmore Strand and the village and lake at Keel, along with the mountains of Croaghaun and Slievemore. Descend Minaun via the same mountain road, and turn left to continue along the Mweelin road towards Cashel. From here you can either turn left and proceed towards Keel and lower Achill, or turn right to return to Achill Sound, your starting point on this loop of the Atlantic Drive.